If you wanted to see the historical Tower of London, why not do it fromthe ice? Unlike many other rinks, this is no hastily assembled iceenclosure. This ancient prison actually opens up a section of its moatevery year to skating enthusiasts, meaning you can get right up to itswalls and view the famous building from very close quarters. A bit further out of the city you’ll find the majestic Hampton CourtPalace, the original home of King Henry VIII in the 18th century. Ifyou’ve never been to this stunning estate, why not check out the skatingrink here. Just make sure you have time to explore the whole palace whilstyou’re there, including extensive grounds and the renowned hedgerow maze. Hyde Park Corner may not sound particularly exciting, but during thewinter months it transforms itself into a wonderland. A gorgeous Germanmarket, fairground rides and a circus are just a few of the manyattractions. And lo and behold, in the centre of this chaos is the everpopular ice skating rink. Although overcrowded by families during peakhours, this is a wonderful place to visit in the evening and the parkstays open until 10pm. Another 18th century building, another ice rink. Situated in thecourtyard, this rink is enclosed by the fabulous Victorian house, givingskaters a spectacular all-round view. The venue even hosts late-night clubsessions with live DJs, as well as various other events. A slightly more modern building, but no less impressive, the London Eyehas an ice rink of its own. Sitting just behind the wheel, skating hereaffords a wonderful view of the attraction. You could even combine skatingwith going on the Eye itself, as well as checking out the Southbank’swinter market and various glamorous bars. 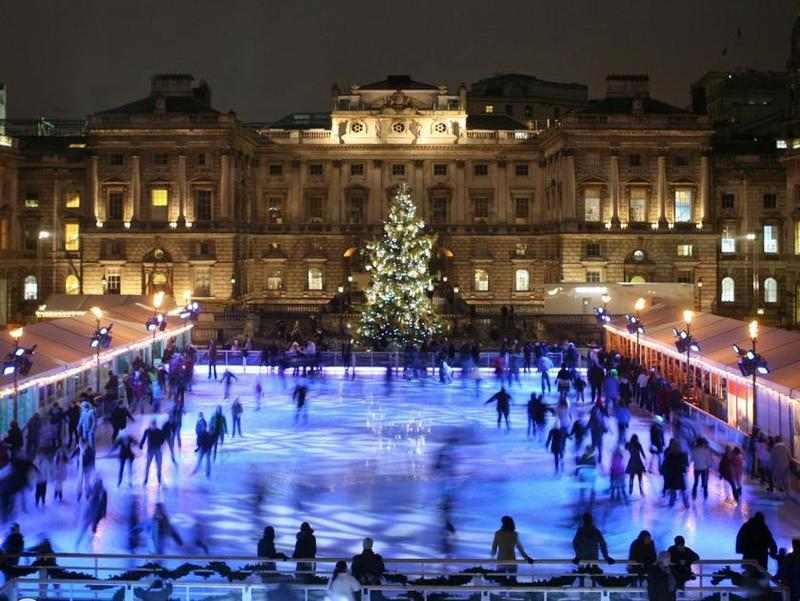 If you’re looking for theperfect winter date in London, look no further. There are many rinks tochoose from, all in unique and stunning locations. Katie Sykes is a travel and lifestyle writer workingon behalf of eharmony.co.uk. Katieloves visiting London and dicovering great new places to visit.